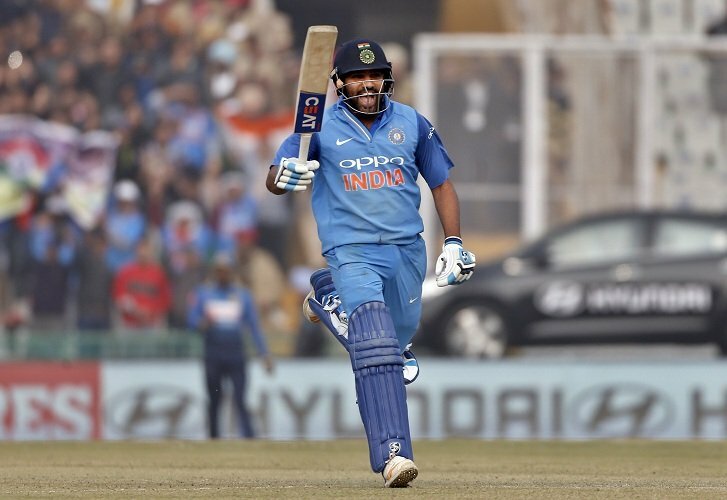 Rohit Sharma hit his third double hundred in ODI cricket and remained unbeaten at 208 runs in the second ODI against Sri Lanka in Mohali. Opening the Indian innings, Rohit took 153 balls to reach his double century and hit 13 fours and 12 sixes in the process. He is the only cricketer to have scored three double centuries in ODIs and two of them have come against the same opponent – Sri Lanka. He had scored 264 runs against Sri Lanka in Kolkata in 2014. The opener’s feat helped India reach 392 for the loss of four wickets in their allotted 50 overs. Sharma is captaining the side in the absence of Virat Kohli and is thus the first skipper to have scored a double ton in ODI cricket. It was the 100th time India went past the 300-run mark in ODI history, the first team to achieve the feat. The Mumbai right-hander, who began his innings cautiously, accelerated the innings in dramatic fashion. He scored his 50 off 65 balls and scored his 16th ODI century off 115 balls. At this point, his strike rate was 86.96. But his second century came off just 36 balls at a strike-rate 277.78. In one over, he hit Suranga Lakmal for four sixes and rocketed from to 116 to 150. Rohit’s first ever double century came in 2013 when he scored 209 against Australia in Bangalore. In that match, he became the third Indian to score a double century in ODIs after Sachin Tendulkar and Virender Sehwag. A year later, he made 264 at Eden Gardens. This score still remains the individual highest by a batsman in 50-over cricket. Apart from Rohit, Tendulkar, and Sehwag, the two other batsmen to score double centuries in ODIs are Martin Guptill (New Zealand) and Chris Gayle (West Indies). This was Rohit’s second century in his last three ODIs. He scored 147 runs against New Zealand in Kanpur in October but failed in the first ODI against Sri Lanka in Dharamsala on Sunday. He was out for a duck there.